ICE Krakow: International Conferencing and Entertainment. Krakow has got its long overdue conference center in October 2014. The city’s flagship congress facility is situated pretty centrally, some twenty minutes’ walk from the Old Town historic center, on the Wisla river bank opposite the Wawel Royal Castle. ICE conference and entertainment center, is situated on the Wisla river bank opposite the Krakow Royal Castle. The ICE Krakow’s main Auditorium Hall can seat 2,000 people. The seating capacity of two other, smaller halls is 600 (Theater) and 300 (Chamber Hall) respectively. Plus there is so called Conference Hall Complex of 11 rooms seating 35 people each, and thanks to their movable walls they may be rearranged into larger spaces allowing various configurations. Other rentable facilities are 32 Multifunctional Rooms with seating capacity from six to eighty people. And last but not least the glass-walled foyer totaling 2,650 square meters on three floors can serve as the venue for shows, trade fairs, banquets or balls. Accessibility of the ICE Krakow Conference Center. Location of the ICE Krakow congress center at the junction of two major traffic arteries, Marii Konopnickiej street and Monte Casino street, makes it easily accessible by car. Krakow airport is 15 kilometers to the northwest, and the city’s Krakow Glowny central train station as well as the main bus depot are 5 kilometers to the northeast. A tram and bus stop, called Centrum Kongresowe, is situated almost next to ICE Krakow, with six tram lines and sixteen bus lines running through it. Rental rates at the ICE Krakow congress center. The entire ICE Krakow conference center can be rented for 70,000 PLN (Polish zloty) per day. Cost of hiring solely the Auditorium Hall for one day amounts to 40,000 PLN. The two smaller halls are let at 30,000 PLN a day for the Theater Hall and 20,000 PLN a day for the Chamber Hall. Daily rents for rooms at the Conference Hall Complex varies from 9,000 PLN to 15,000 PLN depending on their size. Architecture of the ICE Krakow. ICE stands for International Conferencing and Entertainment. The acronym inspired Krakow’s architect Krzysztof Ingarden to create a building resembling a melting slab of ice. 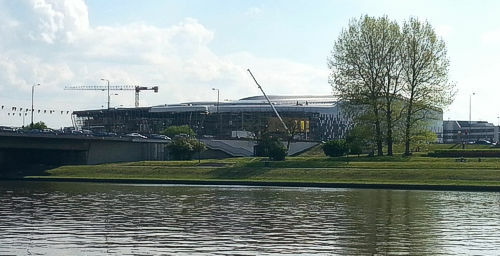 And given a good deal of imagination, one may see some resemblance looking at the actual ICE Krakow congress center. The most striking feature of the building is its glass-wall front facing the historic Wawel Hill and Skalka sanctuary across Wisla river. Contact information for ICE Krakow Conference Center. Postal address: ICE Kraków, ul. Marii Konopnickiej 17, Kraków 30-302, Poland. Operator’s postal address: Krakowskie Biuro Festiwalowe, ul. Olszanska 7, 31-513 Kraków, Poland. Phone (+48) 124249650, fax (+48) 124249652. Email reservations@icekrakow.pl. Copyright © 2014-2018 by MAREK STRZALA. All rights reserved.